Thousands of people gathered at a popular north Dublin park yesterday in a bid to stop more than 500 new homes from being built. Large crowds turned up at St Anne's Park, Raheny, to protest against the development at St Paul's College that will see the playing fields disappear. People arrived shortly after noon wearing red T-shirts with "Hands Off Our Park" printed on the front, with many carrying banners, placards and balloons. Members of local sports teams also wore their club jerseys in solidarity. Crekav Trading, which submitted the planning application, intends replacing the playing pitches with a gym and two all-weather pitches. However, objectors believe it will not be enough to cater for the hundreds of school children in the area. "My boys play GAA every Saturday morning and also soccer and rugby during the week," said mother-of-three Roisin Dooley said. "The loss of the pitches means our children are being squashed into shorter times in the local GAA club, which is on a very small pitch. "It will be a terrible loss if the development goes ahead, and the crowds here today prove how important these lands are to the community." 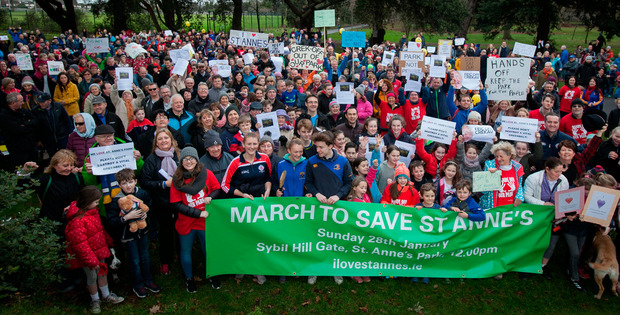 Labour senator Aodhan O'Riordan, who organised the demonstration, said: "We are here today with a very simple message - we want to save St Anne's Park. "Every local councillor at the area committee meeting last Wednesday, who deals with the housing problem every day of the week, is opposed to this development. "The solution to the housing crisis is not to build on playing pitches that local children use or to destroy a local amenity loved by the people of the northside." Mr O'Riordan urged everyone to lodge an objection to An Bord Pleanala before the deadline of February 5. Raheny resident Angela O'Doherty told the Herald: "The pitches are used every day by the local community. There's a housing crisis, but there's also an obesity crisis in this country. "One bad solution doesn't solve the other. 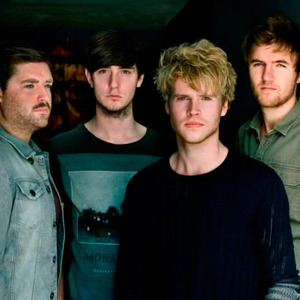 The whole thing sounds like an absolute and utter disaster that hasn't been thought out." Many protesters felt the environment of St Anne's will suffer if homes are built. "There are brent geese unique to these lands," said Marie Quinn. "If these apartments are built, their home will be destroyed." In 1952, The Vincentian Order acquired 14 acres of St Anne's Park, adjoining the back of their school, to use as playing fields. In 2015, the order sold its land to developer Crekav/New Generation Homes in a deal reportedly worth €17m. Clontarf GAA club invested €300,000 in one of the pitches less than 10 years ago. The upgrade was not paid for by grant money but through funds raised by the club, treasurer Tom McCabe said at the time. The investment was made on the premise that the club would have long-term use of the pitch. The Vincentians have said that money raised from the sale is needed for reinvestment in St Paul's College. Part of the funds raised through the deal will be used to develop a new sports hall and an artificial 3G multi-purpose pitch and to upgrade the existing astro pitch. Clontarf Football Club, which has 30 teams, objected to the plan, claiming it will have no home pitch from next month. The club said that while it had been aware of the plans for around two years, it had expected replacement facilities to be made available. Chairman John O'Neill said that only one 4G all-weather pitch will replace three soccer fields, two rugby and one GAA as part of the Z15 land-use zoning objective. Within the submission made to An Bord Pleanala, the club said the 4G pitch only caters for rugby and GAA. The development will consist of 104 houses and 432 apartments along with a creche, private open space and access to lands to the east of St Paul's College. The developer could not be contacted for comment last night. However, Crekav's application states that the two floodlit all-weather pitches can be reconfigured as three when required. It also points out that the synthetic surface will allow more use than the grass playing fields. The company is spending around €5m on this, which is the subject of a separate planning application.